Marquette Law School released a new poll this week, and friends, the Senate race is neck and neck. 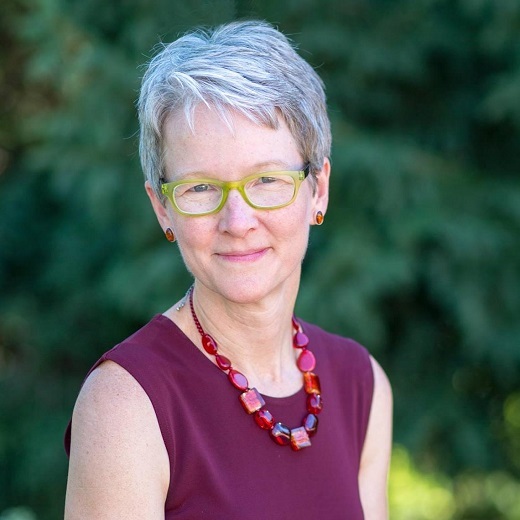 The Koch Brothers spent a whopping $5.1 million against our Senator Tammy Baldwin during the primary, and you bet they’re going to put more resources behind Leah. It reminds me of 2016 when these same billionaires and special interests spent millions of dollars at the last minute to pull off an upset against Russ Feingold. Tammy has put Wisconsin first. She’s fought to defend the millions of Wisconsinites with pre-existing conditions, she stood up to greedy hedge fund managers, and she’s making sure that Wisconsinites struggling with addiction are able to access the care they need. 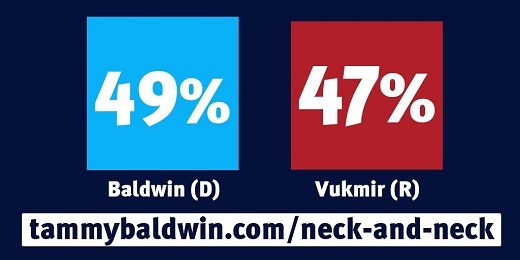 The choice between Tammy Baldwin and Leah Vukmir couldn’t be clearer. Will you help Tammy fight back? Hey Scott Walker, fix the roads! It isn’t news to anyone who’s spent 15 minutes in Wisconsin that our roads are crappy. In fact, 42% of our roads are in poor or mediocre condition, compared to just 19% in Illinois! Our roads are littered with potholes in every corner of the state, and major highway projects have been delayed under Scott Walker’s failed leadership from the I-94 to the I-43 to Highway 15. Despite the sorry state of our roads (We rank 44/50 states! ), Scott Walker chose to divert $90 million away from state highway projects as part of his $4.5 billion taxpayer giveaway to Foxconn! Everyday working Wisconsinites have had to pick up the tab; local “wheel taxes” have nearly tripled and folks pay on average $637 per year on car repairs thanks to our crumbling roads. 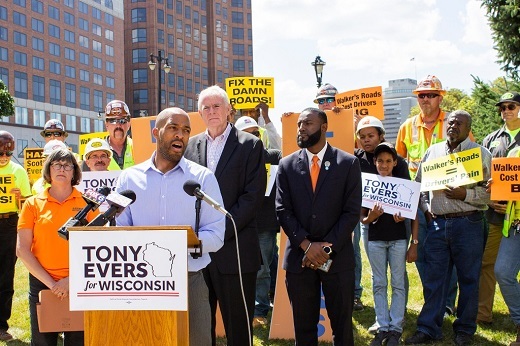 That’s why Tony Evers, Mandela Barnes, and laborers and operating engineers from across the state called on Scott Walker to Fix the Roads! Wisconsinites deserve safe and dependable roads to drive on. Roads touch every part of our lives -- solid infrastructure is particularly important for economic growth, from starting a small business to attracting folks to live in our state! 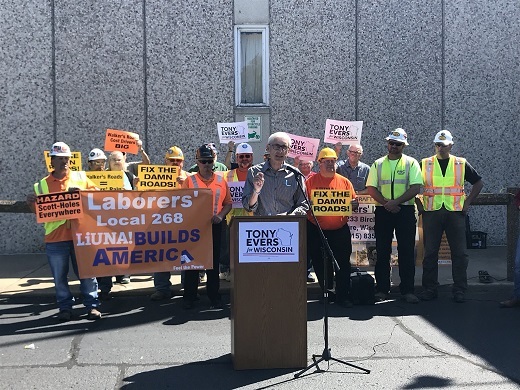 Tony has said that all options are on the table when it comes to fixing our roads, because unlike Scott Walker, he won’t neglect the needs of hardworking Wisconsinites. Maybe Scott Walker would see the urgency in fixing our roads if he actually drove on them! 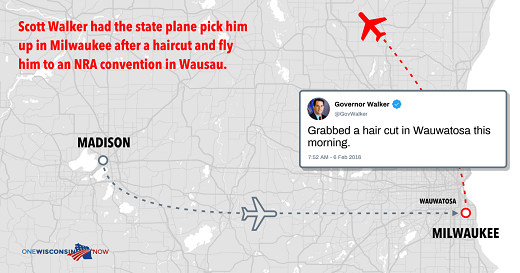 Research group One Wisconsin Now uncovered a trove of documents from Governor Walker’s administrations showing that he has abused taxpayer resources by racking up over $818,000 in air travel costs since September 2015! He frequently flew short distances that could have been easily driven, like the 24 miles from Appleton to Green Bay, the 39 miles from Janesville to Madison or the 24 miles from Kenosha to Milwaukee. And the cost to taxpayers was extraordinary; in February 2016, he used a state plane to pick him up in Milwaukee after a haircut and fly him to an NRA convention in Wausau, and that cost us $2,586! It’s clear that after working as a career politician for 25 years, Walker doesn’t understand the value of a hard-earned dollar. For the average working family in Wisconsin, $2,586, and it’s downright ridiculous that Walker would abuse taxpayer dollars this way. Tony Evers is one of us. While Walker has spent his whole career chasing higher office, Tony has spent his career serving Wisconsinites, teaching our children and leading our schools. I can’t imagine a better person to lead Wisconsin, and I can’t wait to vote for Tony in November. I am running because we cannot afford to stay on the path we’ve been traveling down. Politicians in power are jeopardizing our people, our future, and our institutions for political gain. They have attacked public education, short-changed us on healthcare, aggressively curtailed environmental protection, handed out tax breaks to wealthy business owners, limited the power of county and municipal governing bodies, and answered to donors and special interests when cutting business deals. Like my neighbors, I can’t sit by and watch our leaders take these reckless actions. 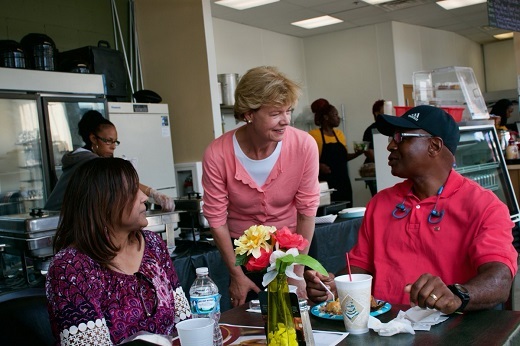 We’ve collectively worked to elevate our voices and now I’m prepared to take on a larger role, proactively and collaboratively guiding Wisconsin down a new path towards opportunity for all.